Cosmetic paints in vibrant colours make any party more interesting! Distribute the paint tubes among the partygoers, and soon there will be no more bored faces! The fluorescent body paints in our range of products glow intensely under the light of UV or blacklight lamps. Paint your body! Our sets can be used for different occasions, no matter whether in carnival or on outdoor celebrations in peak summer season. Our paints glow intensely, last many hours and are easy to remove after the event. They can be applied with a brush, a sponge or simply with your fingers. Neon body paint in XL tubes (5 x 75 ml): These tubes have a sponge applicator built in, so the paint can easily be spread over a big area. Ideal for putting paint on many guests. 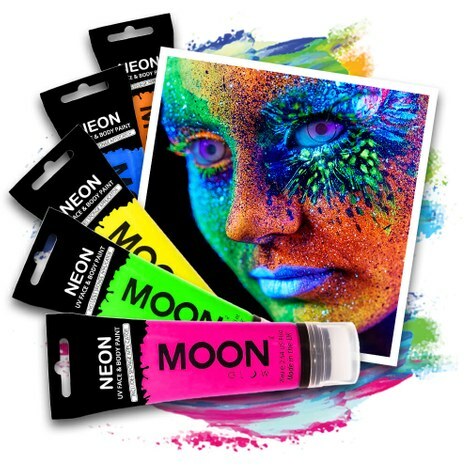 Neon paint sticks: These wax-based crayons are perfect for drawing fine details on the skin. The paint dries immediately and holds very well! Neon glitter set with 5 colours: This glitter can be used all over the body. It also works well on the nails - just fix it with transparent nail polish! How much body paint is needed per person? Our neon body paints can be easily washed off with soap and water!